I'm knitting a chunky cardigan by Tivoli, but don't know how to pick up and knit the collar! More information about what the issue actually is would have been helpful Pauline. I am going to assume that the difficulty is that the yarn is too chunky and it is making it difficult to pick up the stitches the way you normally would with a knitting needle? What I would do is go and find (or buy) a crochet hook that is large enough to comfortably hold the yarn in the hokk and use that to pick up the stitches. 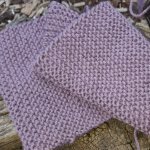 You will have to transfer each stitch to a knitting needle as you pick up each one, but it might be easier that trying to do it with just the knitting needle.